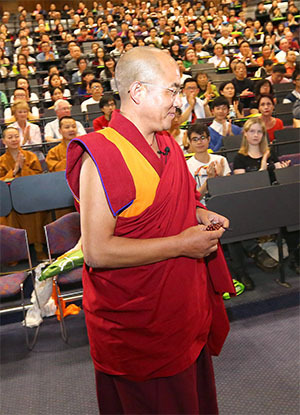 In this speech, Khenpo Sodargye Rinpoche tells us that all people, whatever their ethnic and cultural backgrounds, are seeking happiness. Most people think the secret of happiness lies outside themselves. But eternal happiness can only be found within our own mind. Through cultivation of love and compassion, everyone can embrace the bliss of ultimate happiness. Despite the cultural differences and ethnic diversity of people across the globe, we all share a single common wish: to pursue happiness and avoid suffering. There is a difference between compassion and love. Worldly love is attached to specific conditions. These often include selfish desire and obsession. In Buddhism, compassion is rooted in a noble heart that embraces the spirit of self-sacrifice and the unconditional desire to help others. Without compassion, suffering is inevitable, since the fulfillment of worldly happiness driven by the attachments of worldly love requires effort. Actually, compassion is not just a Buddhist concept: we should all think seriously about it. Shakespeare wrote, “Mercy is a double blessing. It blesses the one who gives it and the one who receives it.” How can we acquire the compassion that is so meaningful in our lives and helpful to others? It comes about through study and spiritual practice. As we exercise our body, so we must exercise our spirit. I see people running and exercising in the pursuit for physical health, but good as this is, it is limited. 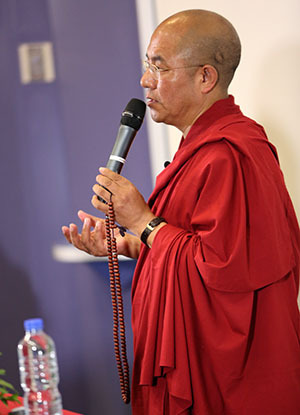 The spiritual achievement of practicing compassion, however, is unlimited—harboring boundless and infinite love. Excerpt 4: How to Cultivate Compassion? How Buddhism Sees the Material World?